Greek cuisine, smog and domestic drudgery was not the life Australian musician, Melody, was expecting when she married a Greek music promoter and settled in Athens, Greece. Keen to play in her new shoes, though, Melody trades her guitar for a 'proper' career and her music for motherhood. That is, until she can bear it no longer and plots a return to the stage--and the person she used to be. However, the obstacles she faces along the way are nothing compared to the tragedy that awaits, and she realizes she's been seeking fulfilment in the wrong place. ABOUT THE AUTHOR: Jessica Bell grew up in Melbourne, Australia, to two gothic rock musicians who had successful independent careers during the '80s and early '90s. She spent much of her childhood travelling to and from Australia to Europe, experiencing two entirely different worlds, yet feeling equally at home in both environments. She currently lives in Athens, Greece and works as a freelance writer and editor. Jessica Bell's poetry and short stories have been published in various anthologies and Literary Magazines. A full list can be found on her website. Additionally, she has written various English textbook materials and is also a singer/songwriter/guitarist. Ms. Bell's experience as an Australian living in Greece has greatly influenced her writing. Jessica Bell has a Bachelor of Arts from Latrobe University, where she studied subjects such as modern English literature, fiction writing, nonfiction writing, screenplay writing, editing and publishing children's literature, myth and ideology, and 18th-century romanticism. 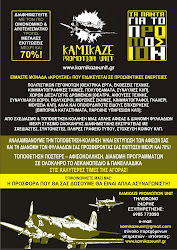 Αναρτήθηκε από Kamikaze Promotion Unit στις 11:22 μ.μ. 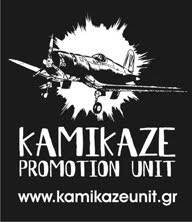 Αναρτήθηκε από Kamikaze Promotion Unit στις 1:24 π.μ.